Decision-making is the art of converting information into action. It’s an art because it requires a blending of experience, knowledge, intuition, wisdom, and information. All of these except information are acquired or intrinsic capabilities. The problem with information is that it is difficult to bring together all of the content needed to make decisions. The result is many decisions are made in the absence of key information. If you think about it, the information needed to make most decisions is likely to be spread across multiple “documents” (e.g. MS Word .doc files, .pdfs, spreadsheets, PowerPoint presentations, web pages etc.). These documents are likely to be all over the place. Each document type requires special software for viewing/editing. Pulling all of these together and keeping them together as documents go through multiple revisions is tedious and time-consuming with no guarantee that all of the information will be where you need it to be at the time you need to make a decision. Another consideration is some of the information needed to make decisions relating to one initiative will be common to other initiatives. Corporate Policy & Procedure is a good example. This means that if you want to consolidate information by initiative, you need to duplicate certain documents. Free-form search Knowledgebases such as Civerex’s CiverManage™ are a solution to the problem of consolidating information and being able to prioritize initiatives that compete for the same scarce resources. Here’s how you can set up a Kbase that can consolidate all of your documents and organize these for decision-making. #1 Start by finding a Kbase environment that allows bulk import of the content of your Windows Directories and files located across various servers/PCs. You want to be able to import entire Directories, not individual files. You will want the documents to import to your Kbase’s underlying database management system. Don’t settle for a system that uses links back to source Directories (i.e. if someone moves the files, the links will break; if someone opens a document from a Directory, edits the document and does a save-as, your KBase will be pointing to the wrong version of the document). #2 Now, organize your documents the way you wish as “things-within-things-within-things”, same as you would organize physical files, within file folders, within drawers, within physical filing cabinets. #3 Once your documents are all in one place, create as many alias documents as you like and park these under as many separate “filing cabinets” as you wish. The way alias documents work is any edits done at any alias document operate on the source document for that alias. This leaves editing to be discussed along with free-form searches. When you click on a stored document for editing, the Kbase environment needs to automatically do a save to the database before any editing starts so that you end up with a full audit trail of your document content. Since your documents are IN your Kbase, file names are no longer needed (the node name, key words / mirrored content are all you need to find a document). The big advantage of Kbases becomes apparent when you engage a search. Whereas traditional SQL searches tell you what a query was able to find (providing you ask the software to look in the right place), a free-form Kbase search tells you visually what the software was able to find and what the software was NOT able to find. This greatly increases the amount of information returned per search. A search at a hospital Kbase can give a patient information regarding which facilities have EMRs but the same search can give a vendor information regarding which facilities do not have EMRs. If you try to look for a phone number in an address field using traditional SQL you will get back “not found” – the same search in a free-form Kbase will find the phone number even if it is embedded in a memo field. It’s not all clear sailing – for fast searches, it pays to mirror document content to plain memo fields but in respect of, say, PowerPoint presentations, images, etc, you need to assign key words at document nodes so that you can find content. Videos are typically too large to store IN Kbases, so these are exceptions to the “no-links” rule. With the exception of videos, you can, following import, move original documents to backup and, hopefully, never have to refer to these again. Consider a filmmaker trying to put together a documentary – there will typically be a screenplay, a project schedule, a project budget, promotional material, financing plans/requests/responses, equipment inventories, multiple video clips, actor/model release forms, copyright permission royalty agreements, etc.. If several projects are being worked on at the same time, some of the content may need to be used across projects. 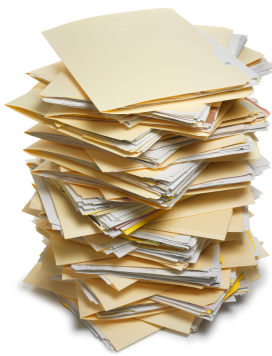 File Folders (paper or electronic) make it difficult to find content. Large corporations can easily have hundreds of active initiatives plus a number of initiatives under consideration, each with its own set of documents. In respect of initiatives under consideration, most of these initiatives compete for scarce resources. This gives rise to a need to prioritize initiatives which is next to impossible to do looking at one initiative at a time. Knowledgebases help with information consolidation (products, products under development, asset inventories, staff, internal policy/procedure, external rules/ regulations, markets, competitors) and since there are no physical boundaries to Kbases, it is possible using “Russian doll” data hiding techniques to have any number of project\folders\nodes at one screen with free-form search facilities across the entire space. The Kbases our group works with usually have in excess of 1,000 documents, sometimes 10,000 documents, all visible and accessible from one screen. Try that on your PC desktop and you will appreciate the value of a Kbase. If you are not using Kbases, you or your assistants probably spend 1-2 hours a day hunting for information. Cost this out over a year and you have the potential to save a lot of money. The quality of decisions you make will improve as a result of having more complete information available if you migrate your documents to a Kbase. If you are in the market for a Kbase, pick a LinkedIn discussion topic that has received 200-300 comments and ask the vendor to put together a demo Kbase comprising the comments, organized respondent by respondent, in reverse chronological order. Try to identify a sub-theme that two respondents have found to be particularly interesting and engage a search. Your search results will automatically thread together the dialog between the two respondents. 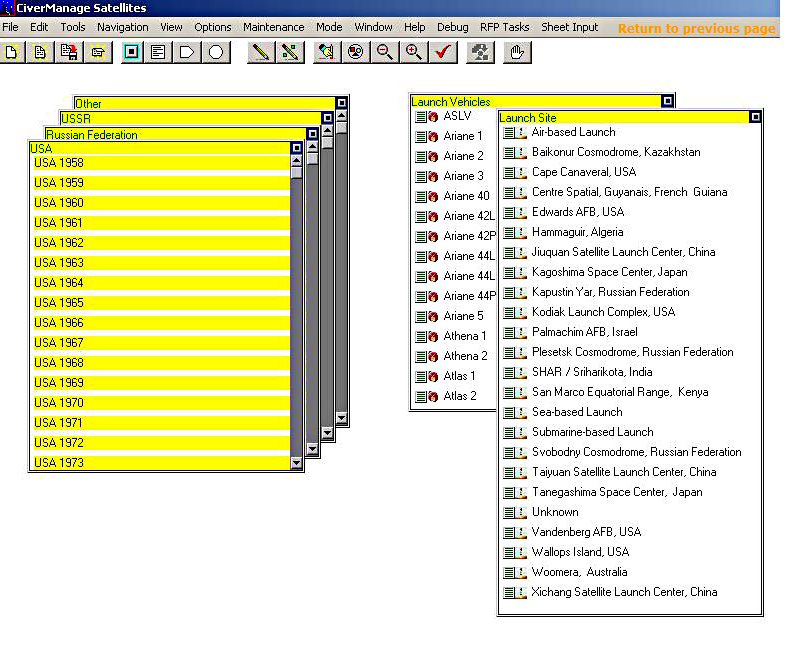 Here below is a screenshot of a Satellite Inventory, comprising some 6,000 documents relating to three Entities (Satellites, Launch Sites, and Launch Vehicles). A search for a Launch Site, will give you site demographics plus all satellites launched from that site (all countries, all years) plus all launch vehicles used. A search for a Satellite will give you demographics for that satellite and simultaneously highlight Launch Sites and Launch Vehicles used. You will be able to see clearly whether a country used a particular Launch Site for a period of time and then switched to a different site. If that country uses one site for commercial launches and a different site for military satellite launches, you will see it. A search for a Launch Vehicle will give you all satellites/sites that have used this launch vehicle. Need to find needles in haystacks? Start using a Kbase today! If you have any questions re your use of Kbases to improve decision-making, call me at 1 450 458 5601. The setup for investigative searches such as encountered in major crimes case management is different. Here, you will want a mix of “things-within-things-within-things” plus networked documents (i.e. multiple hierarchical trees) as you “connect-the-dots”. This entry was posted in Database Technology, Decision Making, Enterprise Content Management, Major Crimes Case Management and tagged ECM, Kbases, Knowledgebases. Bookmark the permalink.